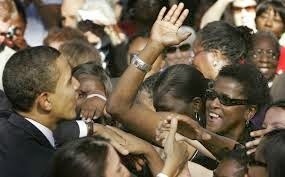 Bluegrass Pundit: What has voting for Obama at a 95% rate gotten blacks? What has voting for Obama at a 95% rate gotten blacks? The percentage of Americans below the poverty line inched up, the latest available Census Bureau data found, from 14.3 to 14.5 percent overall — between 2009 and 2013. For black Americans, that climb was steeper: The 25.8 percent in poverty rose to 27.2 percent. Real median household incomes across America retreated across those years, from $54,059 to $51,939. Though less pronounced, such finances also reversed for black Americans, from $35,387 to $34,598. Food Stamp recipients between 2009 and 2013, the most recent Department of Agriculture figures show, rose from 32.9 million to 47.1 million Americans. Meanwhile, the equivalent number of blacks soared from 7.4 million to 12.2 million. Home ownership slipped from 67.3 percent of Americans in the first quarter of 2009 to 64.0 in the fourth quarter of 2014. For blacks, that figure slid from 46.1 to 42.1 percent. A hopey-changey feeling is so much better than jobs, homes and real income.